Final Concert of the 2018 Season!! 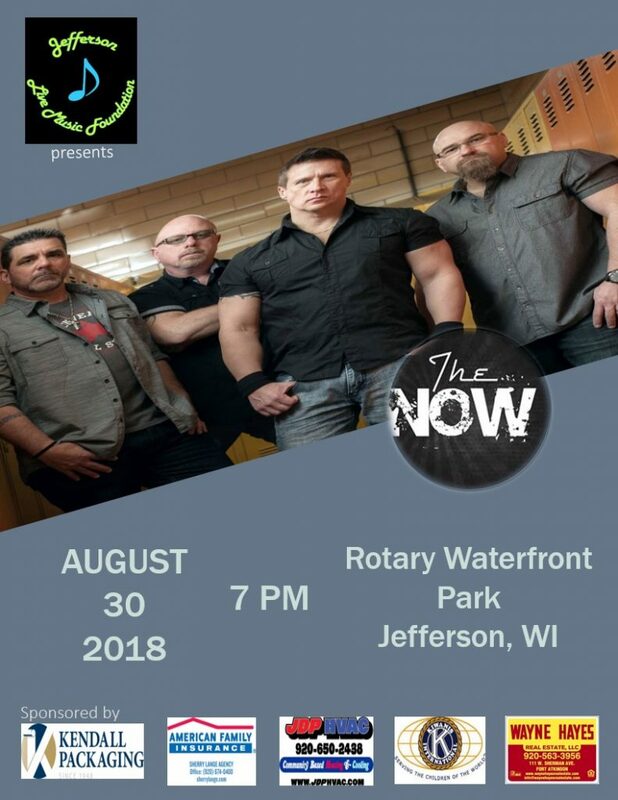 On Thursday, August 30th at 7PM the Jefferson Live Music Foundation will present its final concert of the 2018 season featuring The Now at Rotary Waterfront Park in downtown Jefferson. The Now, a powerful, energetic and enticing rock cover band is sponsored by JDP HVAC, Jefferson Kiwanis, American Family Insurance-Sherry Lange, Kendall Packaging and Wayne Hayes Real Estate. The Now’s musical repertoire covers classic rock through contemporary pop/rock cover material. They are a band that selectively chooses songs and music they truly believe in and stick to who they are by playing songs that fit them as a band. The Now has performed on stage at countless festivals, venues and club, including Summerfest and State Fair, and has opened for some of the industry’s top acts like Pat Benatar, The Offspring, Loverboy, Sister Hazel, Bret Michaels and REO Speedwagon. This free concert presented by the Jefferson Live Music Foundation to be held at the beautiful Rotary Waterfront Park located along the Rock River in downtown Jefferson. Along with concert sponsors, season sponsors: River’s Edge Meat Market, Bon Ton Bakery, Malicki’s Piggly Wiggly, Jefferson Caseys, The Corner, Daily Jefferson County Union and WSJY-WFAW-WKCH aid the Jefferson Live Music Foundation’s mission of providing free, quality entertainment for the whole family. Food and beverages will be available for purchase. This week Tomorrow’s Hope Team Friends and Family will be benefiting from the sales in the concession stand and the Jefferson Lions Club will benefit from the beer sales. Staff members from the Jefferson School District will be manning the grill all summer long. Stop down and show them your support! The Jefferson Live Music Foundation is a non-profit organization run by an all-volunteer, seven-member board of directors. The mission of JLMF is to bring the community together by providing free musical entertainment all summer long. Jefferson Live Music Foundation’s Concerts at Rotary Park summer music series was voted “2018 Best in the Area to Hear Live Music” by the Daily Jefferson County Union reader’s “Best of the Area” poll. admin August 27, 2018 . No Comments on Final Concert of the 2018 Season!!. Categories: Uncategorized. Join us for an afternoon of raffles and fun as we announce the 2019 Concerts at Rotary Park Season! !